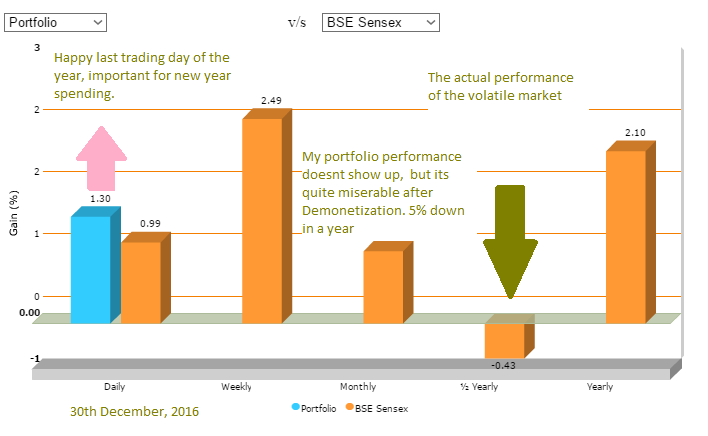 How to win in Indian stock markets post Demonetization | "Blogging by the Road not Taken"
The recent March, 2017 Indian elections has had a favorable effect on the Indian stock markets. The rising markets and my own rising portfolio gains made me curious to explore more. Firstly, what is the trend post Demonetization? 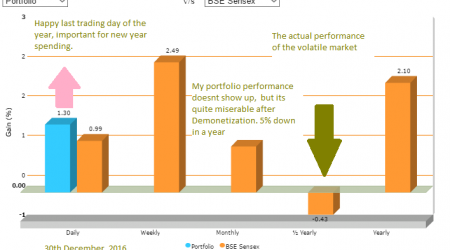 Post the initial fall during demonetization (November 8th, 2016), the stock markets have begun to rise aggressively. Only time will tell if this trend sustains. The favorable state elections in march has helped for now. Implementation of the GST and other reforms with minimum opposition helps give more flexibility to implement reforms. Honestly, the present Modi government can literally do anything and no one would dare to oppose. Nonetheless, Modi also knows that he wont go far with a country of Sheep and Hyenas. He needs happy Bulls to take this country ahead. Firstly, the earnings need to catch up with the high PE ratios. Secondly, the government that may have succeeded in collecting more taxes needs to also ensure growth. Post demonetization the sentiment is bad around certain sectors. Although the higher taxes collected to GDP should ensure a stronger rupee. Foreign investors should benefit in investing in a rupee that is backed by higher tax collection. So here is my Indian stock portfolio in action on the last trading day of the year. I beat Sensex with a high beta day. My portfolio being more riskier than the Sensex & Nifty tries to hedge risk with large cap companies to be less riskier than Mid Caps and Small Caps. I have a broad diversified portfolio, but unfortunately I didn’t see Demonetization coming. Volatility in Indian equities is so high, that I quite often contemplate selling on highs, but I have maintained discipline to see my Aurobindo Pharma go from 20% Down to 15% up, back to 15% down. Stock Markets are volatile and are often manipulated to facilitate big entries and exits. Investing in India is also considering the “side-muscle power” or the “contacts” of the company. I have tried to stay away from this bias as I always seek fundamentally strong companies with limited liabilities and outstanding debt. Understanding that as politicians come and go, the “side muscle power” will also go, hence I would ideally want to find a company that would be profitable without the need of any crony capitalism boost to it. Not easy to find many such companies as all big corporates are affected tremendously with small legislative differences. The risk is just too much. The risk of the Indian markets falling on the last day of the new year can result in a tremendous cut in spending even amid the rich, while the present liquidity troubles among the masses is already affecting the rest. But the strange thing to realize here is how stock markets influence the moods of the rich and privileged. When 1 % up and down can result in big wealth swings, consistent bearish markets can seriously trigger high state of depression while a long bull market may lead to states of ecstasy. How to become the Richest Man in Babylon? I have a long way to go. The thing about stock investing is that it could be played like a very long game of golf. have a look at this scenario which is easily doable by a lot of working Indians. Put in 1 lac of investment and keep pouring in 10,000 rupees a month in sound diversified fundamentally strong companies for 10 years and see your portfolio grow to over 34 lacs in 10 years. In 20 years, things just reach a whole different level as you have 1.8 crores waiting for you from just small 10,000 rupee deposits every month for 20 years. In 30 years you have 8.2 crores, and in 40 years you have 36 crores. 50 years of diligent small investing can give you over 161 crores. The richest man in Babylon advices you to save 10% of every income and invest it. If you can do this diligently, you will join him in richness. How can every one become rich? Start investing early in the stock market. Invest 10% of your income and within 20 years, you will have a big sum. Have more patience and you will be much richer. Invest in fundamentally strong companies. You must be familiar with the products. The company should have a dividend paying history for years. Make sure there is a consistent increase in dividends. Invest across sectors. Diversify your portfolio and in the long term you will win. You can never time the stock markets. Many of my best performers have suddenly risen. They have performed much better than other recommended by experienced people. Its important to start early and keep it going. The saving + investing action with reinvested income compounding the effect of wealth generation over time. By staying long in equities, you incur minimum broker charges allowing your returns to compound brokerage free..
Do stock markets control public mood? Apart from the gains on New Years, we also have an election result rise currently. Stocks do behave strangely. Almost like a message to everyone that everything is in great hands. In many ways the increased tax collections are welcoming. Alternatively, the government needs to meet tax collection with some fiscal spending. Efficient spending which would serve some purpose. 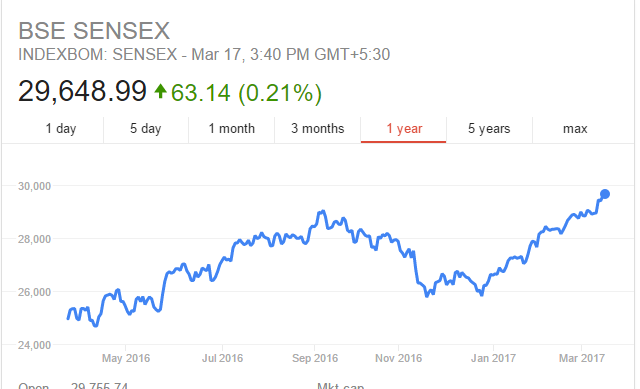 Lets say our mood can be regressed with the Sensex in India. The major players like Foreign Financial Institutions and Domestic Institutional Investors may seem to have a major say on how we feel, but they often outsource the work to an Investment Consultant who is tasked in finding the best people to manage the funds. The asset manager in turn takes help of the banks who also need the accounting companies to audit everything they do and in this big web that finally factors the price of the equity. Everyone has their stakes held on to a system that may not be perfect, but it allows the flexibility to improve it. So who controls our mood may seem like the stock market and every one around us and the economy and what not. But the fact is that only you control your mood. the stock market can always go higher just like your expectations after a big bull run you may have witnessed in an earlier decade. Check Moneycontrol.com for more awesome tools and info. Next PostNext How to improve website ranking by millions?